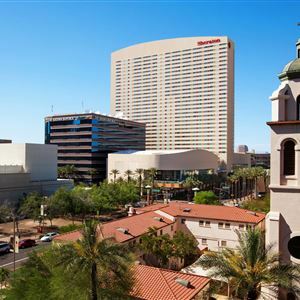 Property Location With a stay at Sheraton Grand Phoenix, you'll be centrally located in Phoenix, steps from Arizona Center and Herberger Theater Center. This 4-star hotel is within close proximity of Saint Mary's Basilica and Phoenix Convention Center. Rooms Make yourself at home in one of the 1000 air-conditioned rooms featuring refrigerators and flat-screen televisions. Satellite programming and video-game consoles are provided for your entertainment, with wired and wireless Internet access available for a surcharge. Private bathrooms with shower/tub combinations feature complimentary toiletries and hair dryers. Conveniences include safes and desks, and housekeeping is provided daily. Amenities Don't miss out on the many recreational opportunities, including an outdoor pool, a spa tub, and a 24-hour fitness center. Additional features at this hotel include wireless Internet access (surcharge), gift shops/newsstands, and a television in a common area. Dining Satisfy your appetite at the hotel's restaurant, which serves breakfast, lunch, and dinner, or stay in and take advantage of 24-hour room service. Quench your thirst with your favorite drink at a bar/lounge. Business, Other Amenities Featured amenities include wired Internet access (surcharge), a business center, and limo/town car service. Planning an event in Phoenix? This hotel has 80,000 square feet (7 square meters) of space consisting of conference space and meeting rooms. Self parking (subject to charges) is available onsite. With a stay at Sheraton Grand Phoenix, you'll be centrally located in Phoenix, steps from Arizona Center and Herberger Theater Center. 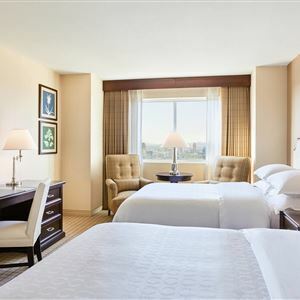 This 4-star hotel is within close proximity of Saint Mary's Basilica and Phoenix Convention Center. Make yourself at home in one of the 1000 air-conditioned rooms featuring refrigerators and flat-screen televisions. Satellite programming and video-game consoles are provided for your entertainment, with wired and wireless Internet access available for a surcharge. Private bathrooms with shower/tub combinations feature complimentary toiletries and hair dryers. Conveniences include safes and desks, and housekeeping is provided daily. Don't miss out on the many recreational opportunities, including an outdoor pool, a spa tub, and a 24-hour fitness center. Additional features at this hotel include wireless Internet access (surcharge), gift shops/newsstands, and a television in a common area. Featured amenities include wired Internet access (surcharge), a business center, and limo/town car service. Planning an event in Phoenix? This hotel has 80,000 square feet (7 square meters) of space consisting of conference space and meeting rooms. Self parking (subject to charges) is available onsite.